The “Souvenir photos of Versailles” project was born 3 years ago, from an intuition. 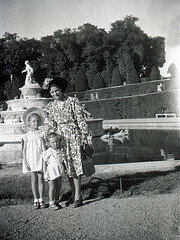 Several people working at the Palace found pictures in their family photo albums of themselves as children or of their older relatives visiting Versailles. At first, it was an opportunity to share them during lunch or coffee breaks. But every day there were more and more pictures; an intimate and moving testimony of the everyday life at the Palace in the 20th and 21st centuries. It was obvious that we needed to launch a major international on-line collection of these souvenir photos from our visitors. What if everyone had pictures like this in their albums or files? Would we be able to illustrate a history of souvenir photography at Versailles? Just how far back could we go? We have a lot to learn from our visitors in general. This project in particular has enabled us to discover the connections that they have with the Palace and its Estate. These connections differ widely, of course, but they are rich in stories and anecdotes that demonstrate a real attachment to Versailles. Three years later, over 1,000 snapshots, both old and contemporary, have been collected in the Flickr “Souvenir photos” group. A young researcher, Noémie Couillard, carried out a series of interviews with some of the contributors. During these interviews, by telephone or by videoconference, in French, English, or Italian… she gathered their stories based on the photo they posted, between a family narrative, an attachment to a heritage and a passion for photography. 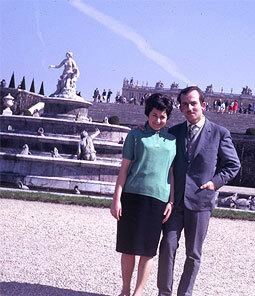 Fabien Opperman, chief curator and historian, also contributed information on the contemporary history of Versailles. This site presents a selection of some one hundred souvenir photographs chosen from the Flickr group and which are representative of the diversity of the “new collection” that is being developed. We have chosen to place them in a timeline and to group them together by themes so as to propose a few lines for reflection on this new kind of collection. The contributors who were interviewed also accepted to have their stories published next to their photograph. But that is not the end of the story. Thousands of souvenir photos remain to be collected, please keep posting them on Flickr. This site will be expanded with new contributions over the months. A new series of interviews will also be carried out soon.